When working on any project I always keep my personal design signature in the back of my mind, it's basically the branding for JDD. By placing parameters on the design process, 'Product X' is more likely to clearly communicate the values that define me as a designer. In saying that, it's not the beginning and the end of a project. The design process needs to be openminded and flow organically, particularly at the beginning but I find that when I hit a metaphorical brick wall or when I need to validate my decision making I reference my design signature as a tool to help me progress. 1. Personal Attributes: Things that I am naturally interested in. 2. 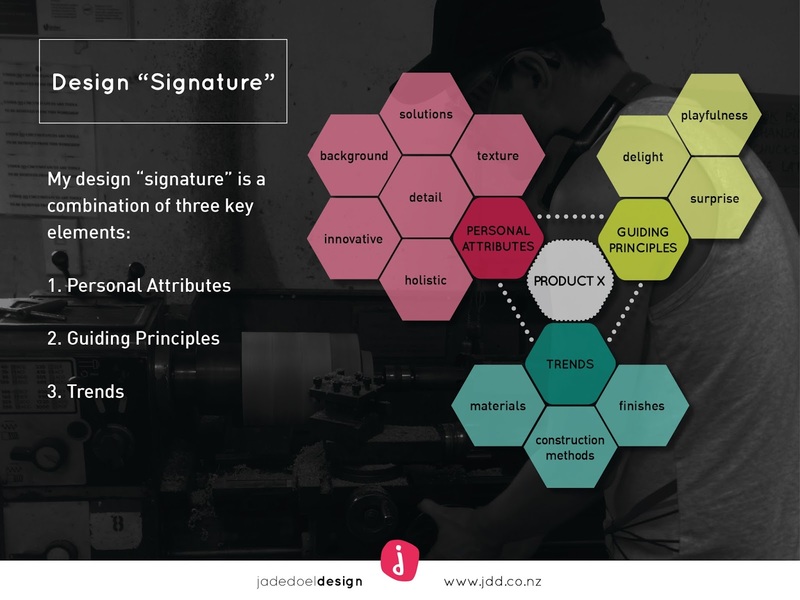 Guiding Principles: The elements that make my design unique. 3. Trends: The reflection on past, the consideration of current and the anticipation of future trends in design.